Traditionally, a sense of the spiritual has been evoked in the depiction of religious themes. For example the humanity of the divine shown in Christian pictures of Christ on the Cross, the image of meditation expressed in Buddhist images of the Buddha, and the ideal of order shown in Islamic decorative art-work using repeated geometrical patterns. More generally, however, the visual arts since the beginning of the 20th century have been associated with a wide variety of aesthetic expression usually not seen as spiritual. It has no longer been normal in the West to assume that all art aims at beauty. Much artwork in this period might be described as reflecting emotional liberation, political criticism and hedonism. The question arises as to whether it is possible for the spiritual to be seen in abstract art? One person’s answer to this question was a definite ‘yes’. This was the Russian artist Wassily Kandinsky. He wrote The Art of Spiritual Harmony published in 1919. Kandinsky favoured painting in non-representational ways, i.e. not representing anything visually recognisable. This was because he thought the more obvious the separation from nature, the more likely is the inner meaning to be pure and unhampered. Art historians believe the book had an important impact on the development of abstract art in the twentieth century with a main focus shifting towards the appreciation of the form of lines and colours in combination rather than representational image. Representational art is still to be found to this day, but it is no longer pre-eminent in the way it once was. 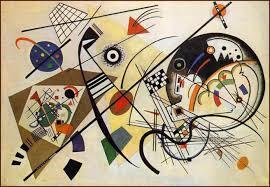 For Kandinsky a sense of awe is present in all ‘true art’. Presumably then, the spiritual in art amounts to more than what is merely ornamental, good taste or interesting but should suggest a sense of wonder. He wanted artists to express their own inner lives on the canvas. We might think that in this way the viewers’ increased sensitivity to the needs and suffering of others can deepen their own spirituality. The term ‘spiritual’ for Kandinsky thus refers to wonder, awe and depth of experience. I would suggest it might also involve a sense of beauty, joy, harmony, fresh vision or innocent simplicity. Kandinsky picked out for praise the art of Paul Gaugin (a post-impressionist) saying the Frenchman, although a creator of figurative paintings, was nevertheless willing to sacrifice conventional form to inner expression and give a profound emphasis on what cannot be expressed in natural things. Kandinsky himself tried to paint without recourse to natural form or representation. His theory was that in such a painting there would be no symbolic references with which the viewer would associate ideas and feelings – by which I suppose he meant natural pleasures and sentiment. He claimed his work was more purely spiritual as a result of being abstract art. One wonders, in so far as a picture creates a sense of transcendence, whether it does so because of a subliminal use of symbols of which both viewer and artist is unaware. For example Kandinsky points out that, although Picasso and the Cubists produce intricately balanced lines and curves, they nevertheless persist in giving titles to their pictures which recall the natural object from which their minds ‘first took flight’. I think these titles as word symbols bias the viewer to the artist’s intention. This attitude is in contrast with the nineteenth century. For example artists, of the so-called ‘spiritual school of American art’, tried to project, in their visual art, a celebration of ideals rather than the material side of life. In their painting of natural objects, they used nature, not as an end in itself, but rather to represent what they saw as inner truth. Some of these artists (such as William Page, George Innes and William Keith) were aware of Emanuel Swedenborg’s theory of correspondence. This theory suggests that we can intuitively see spiritual qualities like innocence, protectiveness, courage, in natural things to which they correspond. Kandinsky approached art very differently to that of the earlier American school. Yet, he equally concerned himself about the way art had lost her soul. He introduced the phrase ‘art for art’s sake’ as a neglect of inner meaning. 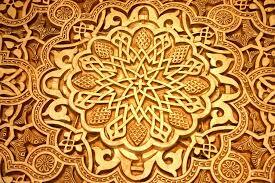 Islamic artwork, is also mostly non-representational. The Islamic world’s resistance to the representation of living forms probably stems from the belief that the creation of life is unique to Allah and to paint animals and plants amounts to idolatry. Swedenborg’s way of understanding spiritual history is in line with this view. His theorised that humankind over the ages lapsed into more and more external perception. As a consequence, works of art, such as ‘the golden calf’ of the Hebrews, lost their symbolic meaning. Furthermore, the populace worshipped them as idols, rather than use them as mere reminders of spiritual qualities. Likewise, in recent centuries there has been widespread veneration of relics, icons and other objects by many Christians. My thought is that as culture has developed beyond this primitive religiosity, people have less frequently idolised or venerated artwork. If so, perhaps the Muslims have taken the problem of idolatry too far and should take a more positive attitude towards representation of natural life forms. The appreciation of art is a subjective thing. They say ‘beauty is in the eye of the beholder’ but what do you find aesthetically attractive? One might judge a Lamborghini to be beautiful because of its curved lines and partly because it is desirable as a status symbol, or we might judge it to be repulsive because it signifies for us over-consumption and offends our political or moral values. There is no pleasing everybody and visual designers cannot escape subjectivity in the spectator. What one person sees, as sublime in a painting, another does not. I suspect I won’t see much of anything spiritual in art when I am focused on worldly matters and my own self-interest. Is there not mystery in the perceptual process of the spectator as well as in the creative process of the artist? Previous Previous post: Inside Out – Entertainment That Teaches? Next Next post: Astral Plane – Real or Imagined?